Whilst Belgium might be a small country, it has a huge international economy and is consistently ranked as one of the best places to live - and not only because some of its best-known exports are chocolate and beer. When you choose to arrange your postage to Belgium with DPD Local Online, you can be certain that you’re booking a parcel delivery service that you can trust. 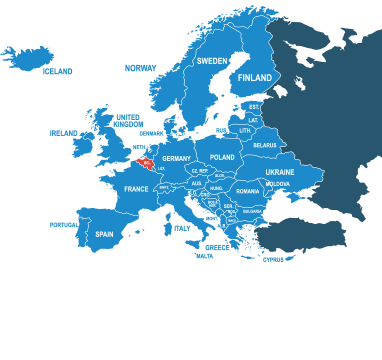 A hugely popular destination for cheap parcel delivery from the UK, our extensive European parcel courier network is used to meeting high demand. We can get your parcel to Belgium quickly and at a price that will meet your budget. Calculating the cost of postage to Belgium is easy with our simple-to-use online form, which puts our economy and express courier delivery services at your fingertips. Whether you’re sending a parcel to Brussels, Antwerp or Bruges, you’ll find that DPD Local Online are the best value when it comes to arranging your postage to Belgium. Book now to arrange your cheap parcel delivery with DPD Local Online. Belgium is a part of the EU, which means that you won’t need to attach any customs documents when posting to Belgium from the UK. Postage to Belgium costs as little as £12.50 plus VAT when you buy through DPDLocal-Online. We are able to determine ways of making deliveries more effective, and we pass all of the savings on to you. And now you can save even more when you take advantage of our bulk shipping discounts. Belgium adheres to the same addressing rules as the UK, so when addressing your parcel you can largely just follow the same rules you might when addressing a parcel within the UK. There’s a detailed breakdown of how to address a parcel to Belgium produced by the Universal Postal Union that you can read here.